Spring-loaded folders is one of the Mac’s best features since it’s convenient and it can save you time when you’re putting files into folders. Interestingly, this feature is not widely known or used. Clients are always amazed when I show them. Below are some simple written instructions on how to use spring-loaded folders. Spring-loaded folders lets you drag a file from one folder through another folder and into a sub-folder. Here are some step-by-step instructions. Click on the icon for a file and drag it on top of a folder, but don’t release the file’s icon. Instead, simply continue to hold this icon as though you were hovering it over the folder. After a second or two the folder will automatically open and display all the files and folders inside. Now, continue dragging your file’s icon on top of one of these sub-folders. Again, hover the file’s icon on top of this sub-folder. This sub-folder will automatically open. You have just dragged a file through one folder and into a sub-folder. It’s convenient that the folder or folders one traverses, as you move a file into a sub-folder or sub-sub-folder, automatically close themselves. This is very nice and reduces screen clutter. When you get used to using spring-loaded folders you’ll wonder how you ever got along without them. More importantly, you’ll wonder why this feature hasn’t been added to other operating systems – to the best of my knowledge neither Windows nor Linux have this feature. Click on the Finder icon on your Dock. Go to the Finder menu and select Preferences. Click on General then make sure there is a checkmark in the box labeled Spring-loaded folders and windows. Note that you can also adjust the amount of time or delay, that you need to wait before a folder automatically opens. Refer to the image to the right which depicts these preferences. 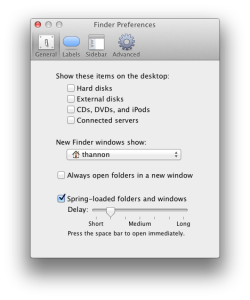 Read more about convenient, OS X, quickly file, spring-loaded folders.